A hot topic in kitchens and restaurants these days is food waste. 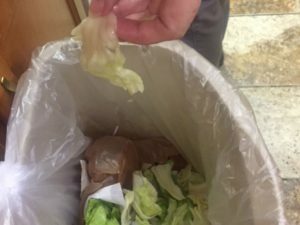 Chefs, restaurant managers, and even consumers are looking for ways to save money and the environment by reducing the amount of food tossed in the trash. The United States Department of Agriculture estimates about 31% of food is lost at the retail and consumer level. Much of this food loss ends up in the landfill. The USDA is challenging consumers to reduce, recover and recycle their food waste. Plan your meals using foods you already have on hand and choosing foods you know you will use before they go bad. Substitute ingredients to include food you already have in the pantry or refrigerator. Create grocery lists using your family meal plan and checking for foods you already have on hand. Plan to use or freeze leftovers for dinners or lunches throughout the week. Watch what is being tossed and reduce your purchase of these items. Make food purchases with packaging in mind. Choose items with minimal packaging. Store foods properly, with food safety in mind. Use food storage guides to properly store food items safely. Use edible parts that you don’t usually eat when it’s safe. For example, save broccoli stalks and stems or potato peels for use in soups and casseroles. Compost your food waste. Contact your local Extension office for more information. Check out this resource on composting. Donate or volunteer with a food rescue program. Next time you throw food in the trash, take a minute to think about taking the challenge to reduce food waste. A few easy steps can help save your family money and the environment for future generations to enjoy. Kendra Zamojski is a Regional Specialized Agent in Family and Consumer Sciences with the University of Florida/IFAS Extension. For more information, contact Kendra at hughson@ufl.edu. Kendra Zamojski is a Family and Consumer Sciences Agent III in the Northwest District.